Product prices and availability are accurate as of 2019-04-18 06:34:51 EDT and are subject to change. Any price and availability information displayed on http://www.amazon.com/ at the time of purchase will apply to the purchase of this product. This portable TV stand is equipped with 4 locking wheels for effortless repositioning throughout a room. Once a destination is reached, simply lock the wheels for added stability. 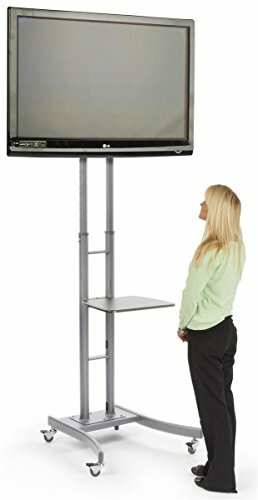 The portable TV stand has a height-adjustable design with 10 positions at which the brackets can be set. The lowest height is 55 inches while the tallest the fixture can be is 90.5 inches tall! 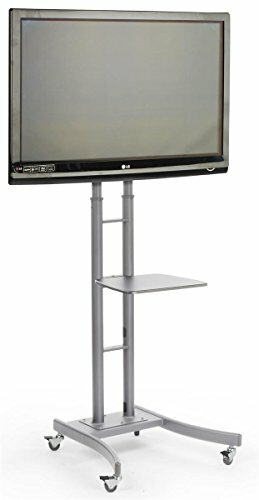 This portable TV stand is designed to hold a flat-screen LCD, plasma or LED monitor between 32 and 65 inches. Please note that the floor-standing fixture can only accommodate up to 175 pounds. 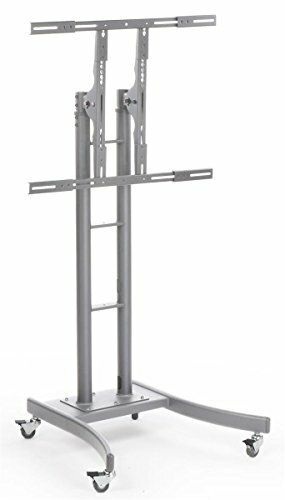 The portable TV stand is equipped with a VESA compatible bracket for the following measurements: 200x100, 200x200, 300x300, 400x200, 400x400, 600x400, 800x400 and 800x600. Please review your monitors VESA mounting pattern before placing an order. The tilting bracket includes extenders for accommodating larger-size monitors in horizontal orientation. The shorter mounts work best for portrait monitors. The portable TV stand is provided with an optional display shelf that measures 19.625 inches wide. Why not use the shelf to display product samples during a presentation or to hold electronic accessories, such as a DVD player or laptop computer? Another great feature of this mobile TV stand is the hollow tubing through which wires can be threaded. Not only does this keep a presentation looking professional, but it will also prevent cables from becoming tangled. The wires will also be more organized, which will prevent injuries. The mobile TV stand ships unassembled to lower costs. Holds a TV between 32 and 65 inches, that weighs no more than 175 pounds. Height-adjustable design repositions a monitor - min height is 55 inches, max height is 90.5. 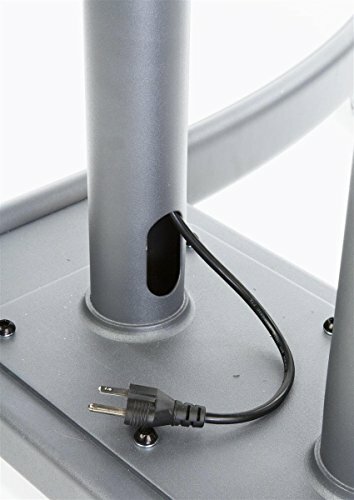 Locking wheels prevent the floor-standing fixture from moving out of place, when in use. Tilting bracket changes the angle of a displayed monitor.